In pre-Columbian times the territory that now the canton of Cartago, was inhabited by indigenous Huetar. Cartago was the capital of the province from the Conquest to 1823. It was created by law 36 of 7 December of 1848 , one of the oldest ones in the country. The city of Cartago is the capital city of the canton, and although, the provincial capital of province of Cartago. In pre-Columbian times the territory which now corresponds to the corner of Paraiso was inhabited by indigenous Huetar called Eastern kingdom. A group of the Conquest a tribe of Indians had established their authority in the region, ruled by the chiefs and Turichiquí Abituri. Paraiso is the second Cartago province and has 39,163 voters (1.39% of the national registry). The name of the third canton in the province of Cartago in Costa Rica is La Unión. It was officially declared by Legislative Decree No. 167 of December 7th of 1848. Though it is the smallest of the eight cantons of Cartigo province, it is the most densely populated. The first settlers came to the area from Carthage in the first half of the nineteenth century. The name of the canton is a tribute to Don Jesús Jiménez Zamora, former President of the Republic. In Act No. 84 of August 19, 1903, created the canton of Jimenez, as the fourth of the province of Cartago. It is one of the largest counties in the country with an approximate area of 1,657 square kilometers, equivalent to about 52% of the total area of the province of Cartago. The city of Turrialba is the cantonal, is at a height of 646 meters above sea level. 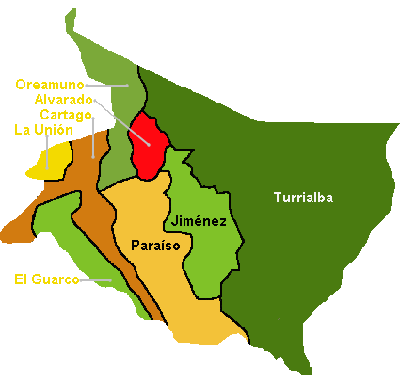 The territory now occupied by the Turrialba, has been inhabited for millennia by indigenous groups. Archaeological studies have revealed the existence of human life from the 9000 BC and the National Museum of Costa Rica has 289 recorded archaeological sites in the canton.